Coming at you today with another pumpkin inspired fall recipe that also happens to be an easy peasy weekday dinner! 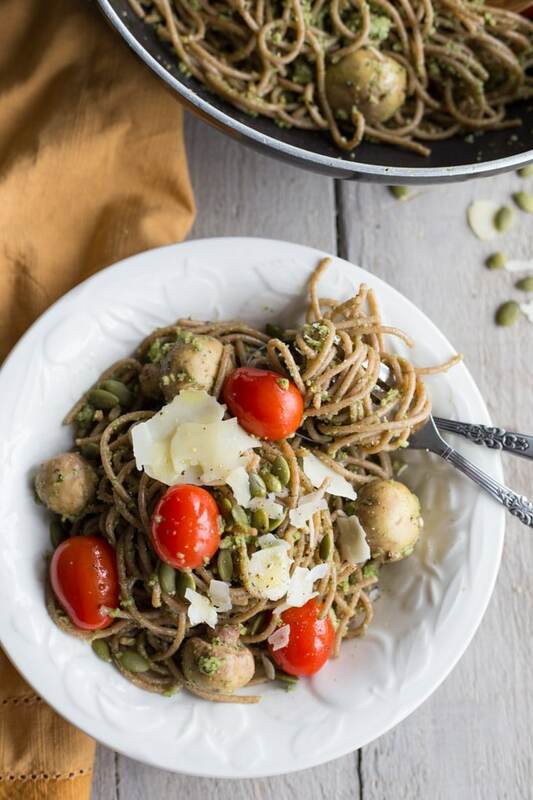 This time, it’s Creamy Pumpkin Seed Pesto Pasta with spelt spaghetti, tomatoes, mushrooms and parmesan cheese! Flavourful and filling, you would never think it’s clean eating! I’ve been a bit pesto obsessed lately and experimenting with different nut, seed and leafy green/herb combinations. 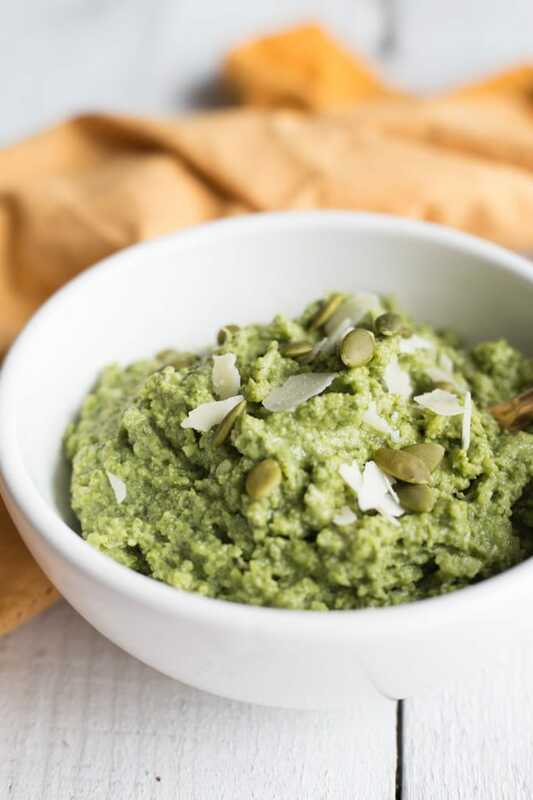 This pumpkin seed pesto was actually inspired by my recent trip to our local farmer’s market where I bought a huge bag of fresh basil. I picked it up to use in a few different recipes, like this vegetarian chili recipe, but I had so much leftover, I decided to use it for a large batch of pesto. I always have pumpkin seeds on hand so this basil/pumpkin seed combo was meant to be!! My creamy pesto recipes might be a bit deceiving because they don’t actually have any cream in them like most cream-based pestos. I keep mine creamy by adding more seeds or nuts than typical pesto recipes, and sometimes I even add a few tablespoons of water to make it extra creamy. 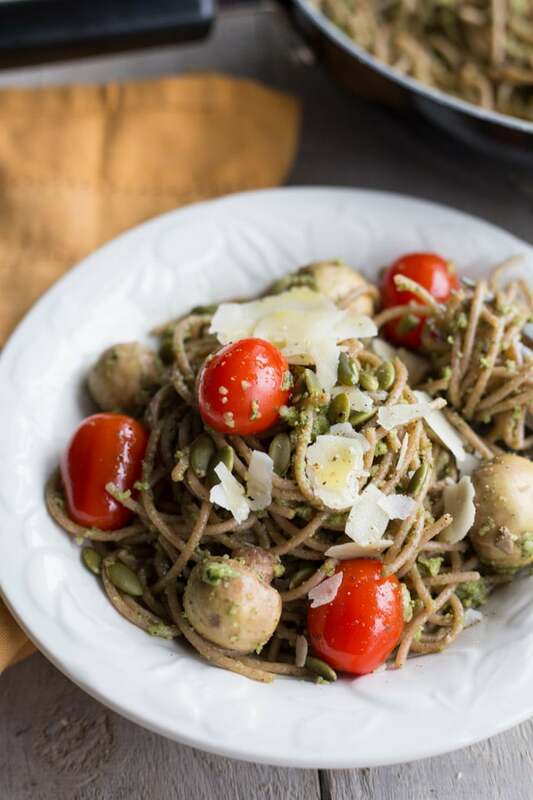 While my “pasta” of choice lately has been zucchini noodles, I decided to try something different for this Creamy Pumpkin Seed Pesto Pasta and picked up a package of spelt spaghetti. Spelt is an ancient grain and high in fibre and protein. While it is a relative of wheat and contains gluten, I’ve read that it’s more easily digested than wheat. So I thought I would give it a whirl. On a side note, I usually avoid wheat based pasta because I find them a bit bloating. This might actually be less about the food and more about the speed at which I eat food 🙂 . I inhale my food and can eat a plate of pasta in about 45 seconds! Seriously, my family and friends will tell you I eat my food like someone is going to steal it from me! And pasta is the ultimate fast eating food for me. So, after promising myself that I would slow down and savour my food, I decided to use pasta in this recipe! 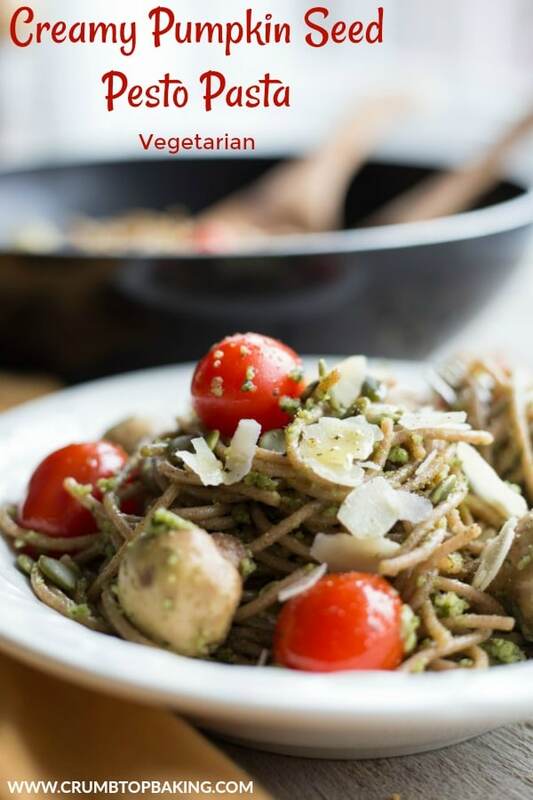 While I used spelt spaghetti, you could use other types of pasta, or even zucchini noodles, which would be totally awesome! This Creamy Pumpkin Seed Pesto Pasta is a quick, almost one pot meal 😉 . The pesto comes together in your food processor quickly and makes about a cup. 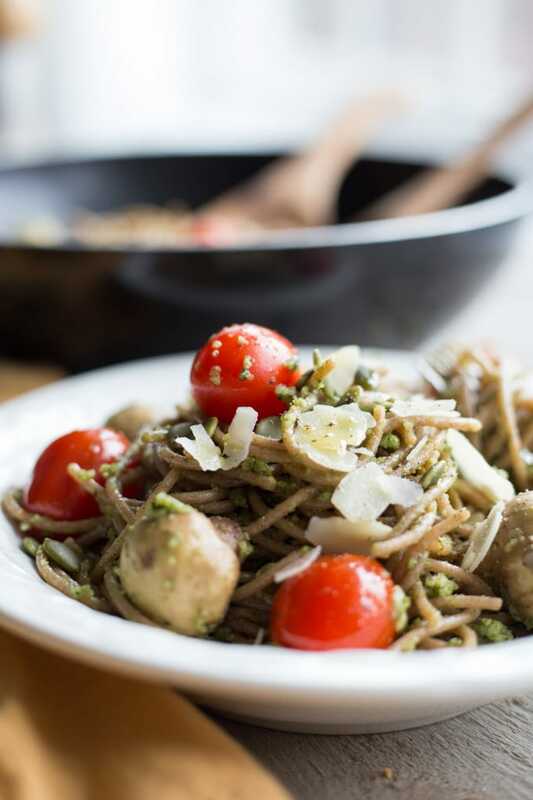 Then, all you need to do is cook the spelt spaghetti, add the pesto, and then the tomatoes and mushrooms. And that’s it. Dinner is served in about 30 minutes! You can get about 4-6 bowls of pasta out of this recipe, so that’s plenty for dinner and leftovers for lunch the next day! I like to serve mine with a drizzle of olive oil, parm cheese and pumpkin seeds. But you can top it however you like! 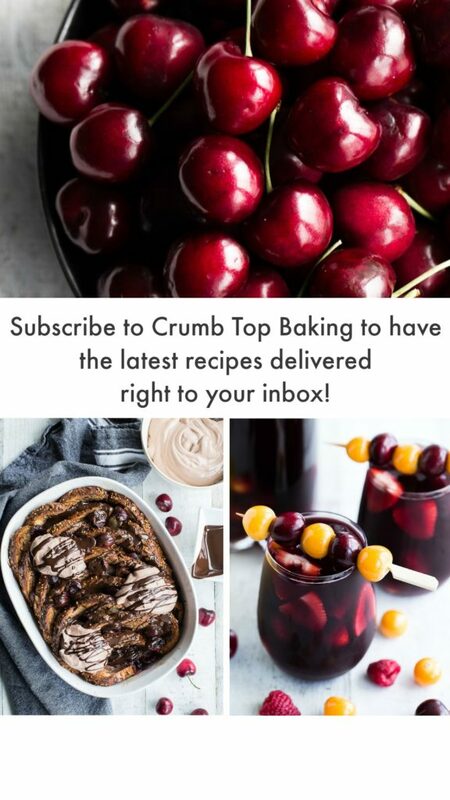 If you make this recipe, be sure to let me know what you think in the comments below, or take a pic and tag it @crumbtopbaking on Instagram! 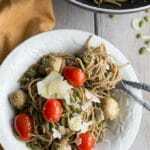 Creamy Pumpkin Seed Pesto Pasta with spelt spaghetti, tomatoes, mushrooms and parmesan cheese. So flavourful and filling, you would never think it’s clean eating! This recipe takes 30 minutes to prepare and makes about 4-6 bowls of pasta. Perfect for busy week nights and lunch leftovers! Add all the ingredients to a food processor and process on high until the mixture is creamy but still contains some small bits of parmesan cheese and seeds. You may need to stop and scrape down the sides a few times. If you like your pesto extra creamy, you can process the mixture for a little longer and add 2-3 tbsp of water. Bring a large pot of water to boil and add the spaghetti (or your pasta of choice), and cook according to the package. I cooked my spelt spaghetti for 10 minutes. Once cooked, drain the pasta and place it back in the pot (or a large wok, which is what I used). Add the pesto and stir until well combined. (I used cooking tongs to help do this). Add the tomatoes and mushrooms to the pasta/pesto mixture, and then cover and let warm on a low heat for about 10 minutes, or until the tomatoes and mushrooms are heated through. Do not over cook as the tomatoes and mushrooms will get mushy and watery. Serve with a drizzle of olive oil, parmesan cheese and pumpkin seeds. Store any leftovers in the refrigerator and eat within 2-3 days. YAY! Now that fall has arrived sweeping in the cooler temperatures, I can’t wait to dig into my favorite fall comfort food. PASTA! This sounds like the perfect weeknight meal! Thanks Christina. Fall comfort foods are the best! That pesto looks so creamy and delish Leanne! 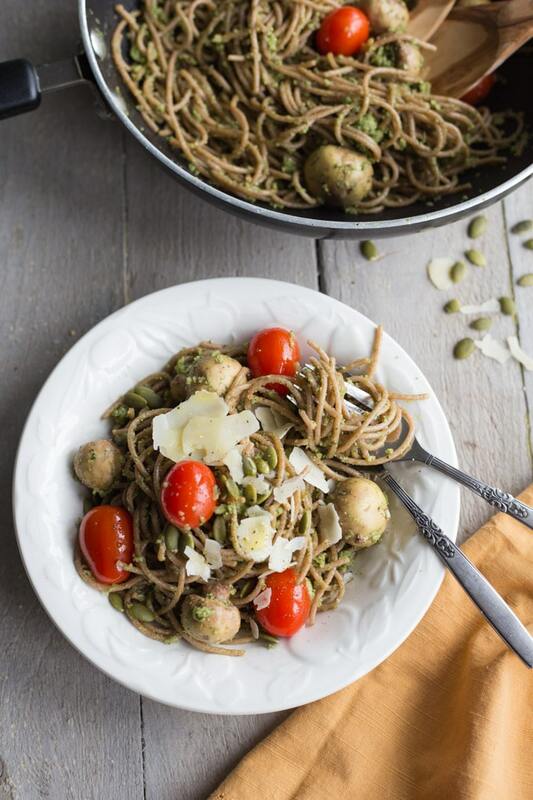 I love the ingredients..I could never have thought of using pumpkin seeds in pesto! Dinner recipes that are so quick and yummy are always great! Thanks Deepika! Pumpkin seed pesto is probably my go-to pesto since pumpkin seeds are on the cheaper side and I eat so much pesto! It’s great in pasta for a quick meal!